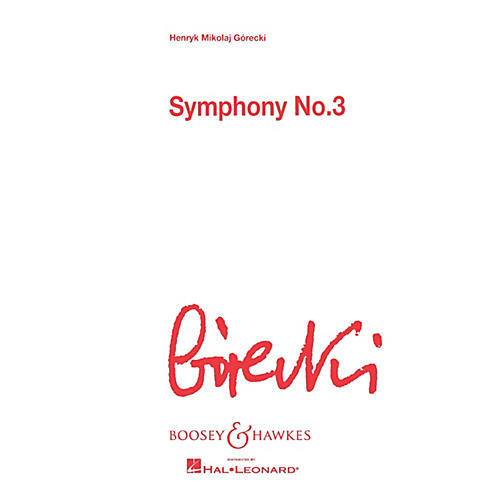 Composed in 1976, the Third Symphony is unquestionably Górecki's most famous work. They symphony is scored for orchestra with Soprano soloist. The first movement opens with a canon for strings that builds in intensity. At the heart of the movement is the 15th century Polish Lamentation of the Holy Cross Monastery, in which the Mother of Christ begs her dying son to speak to her. The second movement contains words to a poem that had been scratched on the wall of a Gestapo cell by an eighteen-year-old Polish girl seeking the Queen of Heaven. The music of the final movement revolves around a Polish folk song in which a mother laments the loss of her son, whose body she now seeks. The movement and symphony ends with a glimmer of hope as the mother begs the song birds to sing for him, and the flowers to bloom for him, so he may rest in peace.